The City of Avondale Estates will be participating in American Express' Small Business Saturday: Shop Small campaign on Saturday, November 28, to support small businesses in Avondale Estates. 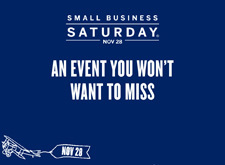 Founded by American Express in 2010, Small Business Saturday: Shop Small is a day to celebrate the small businesses that help support their neigborhoods and is held every year on the Saturday after Thanksgiving. Now in its sixth year, Small Business Saturday: Shop Small has been embraced as part of the holiday shopping tradition as each year shoppers, businesses and public officials come together to Shop Small and show their neighborhood pride. Why Shop Small in Avondale Estates? The City of Avondale Estates is home to award-winning shops and restaurants teeming with gift-worthy goods including fashion, furnishings, art, music, artisan-cured meats, freshly baked treats, carefully selected wine and more. Many businesses are within walking distance of each other, so grab a bite to eat or a cup of coffee, and come explore! Check out the City's free public parking map for places to park around the City. Participating businesses will hand out promotional "Shop Small" goodies to customers. For a list of participating 2015 businesses visit the City's event page. Visit the City's Facebook event page for specials from various participating businesses. Also, check out the business directory for a complete list of businesses within the City. Join in on social media activity by using the hashtags #ShopSmall and #SmallBizSat. Email City Planner and Community Development Officer, Keri Stevens, kstevens@avondaleestates.org, if you're a local business owner interested in participating.